All weights now available as A4 size. 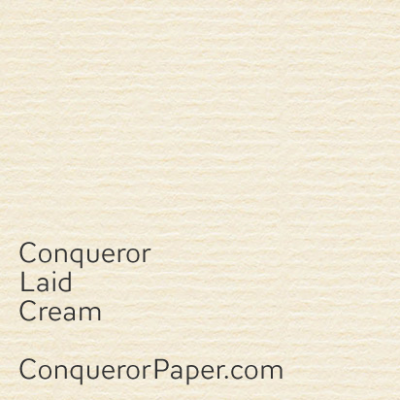 Conqueror Laid, with its traditional ribbed texture originally created to guide handwriting, remains a timeless favourite for stationery and print. The three new shades of grey complement the existing range of whites and creams. 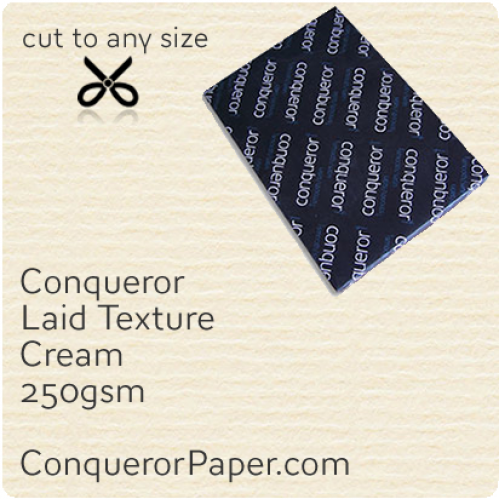 WINDOW = Non Window SIZE = C6 114 x 162mm TYPE = Wallet (flap on long edge) FLAP = Super Seal (Peel and Seal) COLOUR = Cream TEXTURE = .. WINDOW = No SIZE = DL 110 x 220mm TYPE = Wallet (flap on long edge) FLAP = Super Seal (Peel and Seal) COLOUR = Cream TEXTURE = Laid (Classic .. 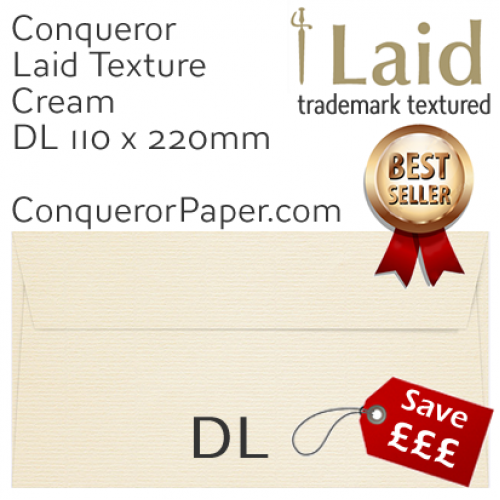 WINDOW = Yes SIZE = DL 110 x 220mm TYPE = Wallet (flap on long edge) FLAP = Super Seal (Peel and Seal) COLOUR = Cream TEXTURE = Laid (Classic.. 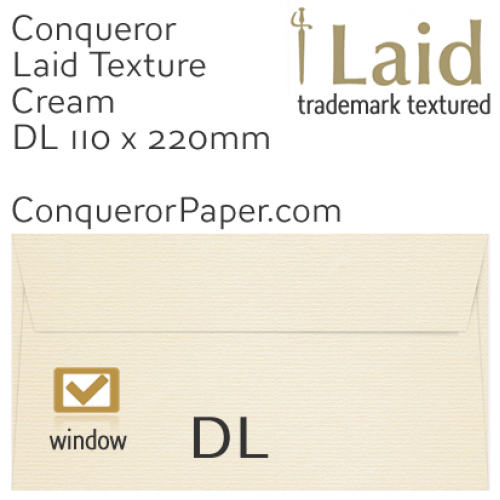 WINDOW = No SIZE = C5 162 x 229mm TYPE = Wallet (flap on long edge) FLAP = Super Seal (Peel and Seal) COLOUR = Cream TEXTURE = Laid (Classic ..
Prestige Envelope* Brand CONQUEROR WINDOW = No SIZE = C4 229 x 324mm TYPE = Pocket (flap on short edge) FLAP = Super Seal (Peel and Seal) CO..
Prestige Envelope* Brand CONQUERORWINDOW = NoSIZE = C4 324 x 229mmTYPE = Wallet (flap on long edge)FLAP = Super Seal (Peel and Seal)COLOUR = CreamTEXT..
Prestige Brand CONQUEROR Paper Premium Quality Product TINT: Cream FINISH: Laid (classic textured) PAPER: 120 gsm ..
Prestige Brand CONQUEROR Paper Premium Quality Product TINT: Cream FINISH: Laid (classic textured) PAPER: 160 gsm SIZ..
Prestige Brand CONQUEROR Paper Premium Quality Product TINT: Cream FINISH: Laid (classic textured) PAPER: 250 gsm SIZ..
Prestige Brand CONQUEROR Paper Premium Quality Product TINT: Cream FINISH: Laid (classic textured) PAPER: 300 gsm SIZ..
Prestige Brand CONQUEROR Paper Premium Quality Product TINT: Cream FINISH: Laid (classic textured) PAPER: 120 gsm &nb..
Prestige Brand CONQUEROR Paper Premium Quality Product TINT: Cream FINISH: Laid (classic textured) PAPER: 160 gsm..
Prestige Brand CONQUEROR Paper Premium Quality Product TINT: Cream FINISH: Laid (classic textured) PAPER: 250 gsm &nb..
Prestige Brand CONQUEROR Paper Premium Quality Product TINT: Cream FINISH: Laid (classic textured) PAPER: 300 gsm &nb..